The Chain of Lakes Trail is a multi-use path that stretches along a 3.6-mile corridor from downtown Winter Haven to US Highway 17/92 in Lake Alfred. The trail serves Winter Haven’s population with a place for bicyclists, joggers, or walkers. 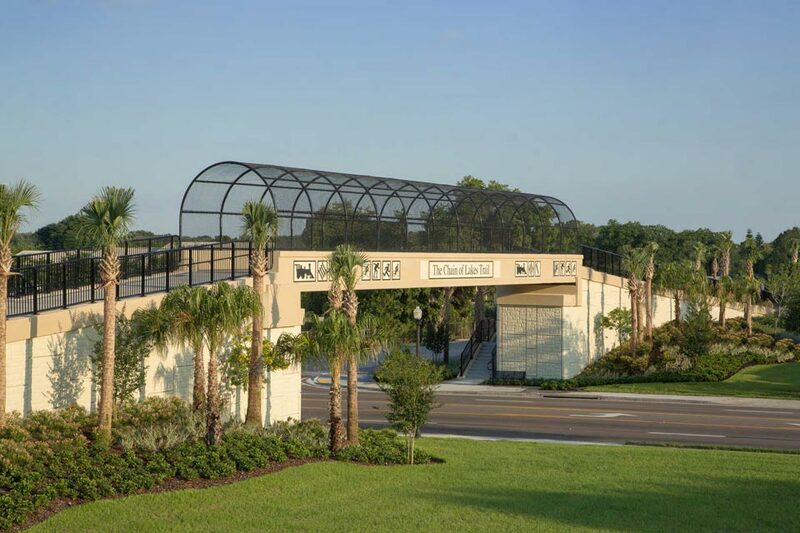 The bridge over Avenue T is a vital link to connect the southern end of the Chain of Lakes Trail to the northern portion, which connects to the McKay Preserve Trail system and into downtown Lake Alfred. The overpass will provide safe and convenient passage for trail users to cross Avenue T, instead of walking to the nearest intersection. The project consists of a low-profile prestressed concrete bridge with its approaches supported by retaining walls, 4:1 sloped embankment to reduce the retaining wall height, Keystone decorative retaining walls, trailhead tie-ins, sidewalk connectors, drainage, and signing and pavement marking. The low profile of the bridge is achieved by a system of precast deck panels supported by the bottom flange of custom prestressed beams. The single span bridge is 107 feet long, with a clear travel width of 12 feet. The total bridge approach length is 620 feet, with cast in place concrete steps provided near the bridge supports for sidewalk access to and from Avenue T.
KCA was awarded a 2014 Award of Merit from Engineering News-Record in the Small Projects category for this project.